A Technical Reference Manual (TRM) is a resource used to help plan and evaluate energy efficiency programs. TRMs outline how much energy can be expected to be saved for certain measures, either through deemed savings values or engineering algorithms. TRMs also contain source documentation, specified assumptions and other metrics associated with energy efficiency measures. Illinois, Indiana, Iowa, Michigan, Minnesota, Missouri, Ohio and Wisconsin use various forms of statewide TRMs to provide the metrics for energy efficiency planning, measurement, evaluation and reporting. MEEA’s 2017 “Midwest TRM Inventory” reviews the use of TRMs or equivalent tools in the region. 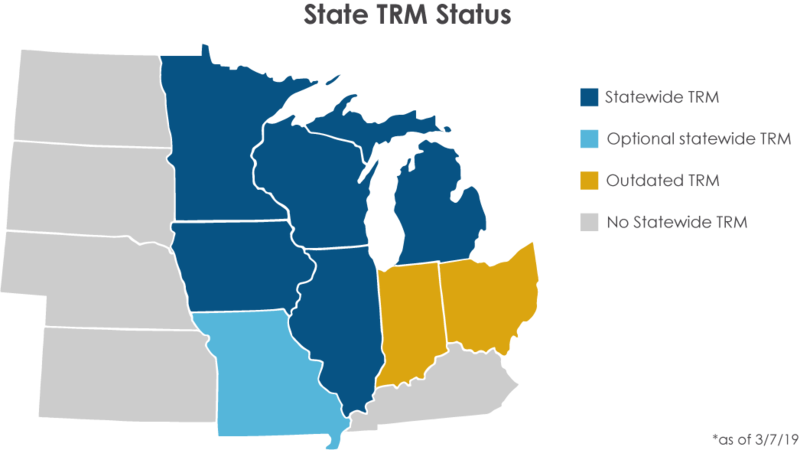 The Midwest TRM Inventory is an in-depth look at the region’s statewide TRMs. MEEA staff analyzed which energy saving measures are included in each and identifyed gaps in included measures that may provide opportunities for additional measure offerings. MEEA remains involved in stateTRM development, use and maintenance in the Midwest.